Spoiler Alert! Contains major spoilers for Marvel’s Runaways Season 2. 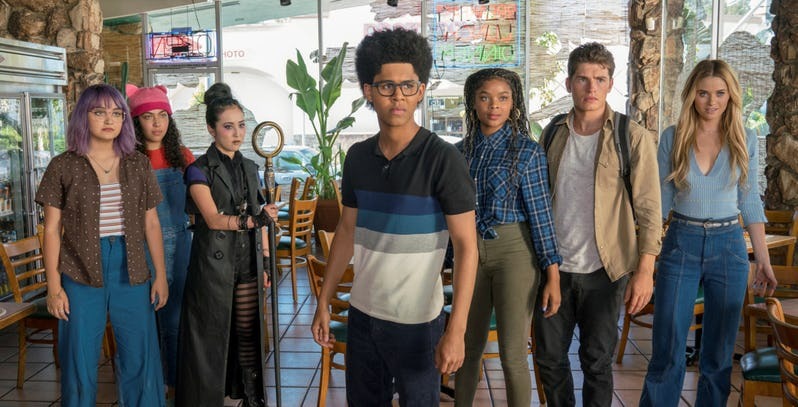 Runaways finished its first season with genius Alex Wilder (Rhenzy Feliz), gothic witch Nico Minoru (Lyrica Okano), rainbow-colored alien Karolina Dean (Virginia Gardner), jock Chase Stein (Gregg Sulkin), young Molly Hernandez (Allegra Acosta), and rebel Gert Yorkes (Ariela Barer) running off into the sunset with Gert’s bio-engineered dinosaur, Old Lace, in one of the most beautiful closing shots of a Marvel TV show. But, aesthetics aside, where were they running off to? What do you do when you discover your parents are killers? Where can you go when you find out their organization, PRIDE, is conspiring with an evil alien called Jonah (Julian McMahon) who will stop at nothing to get what he wants? How far can you run when you’re the only ones who can stop them from destroying California and the world? You can’t, and Runaways acknowledges this early in the season with the team setting up camp in a hidden underground hostel just outside of Los Angeles. That said, even their miraculous shelter can’t protect them from the hardships of this new life, as the teens are forced to deal with death, food shortages, risky partnerships, and their uncontrollable powers. The only thing holding them together is their hatred for their parents’ actions and the need to stop whatever is hiding in PRIDE’s construction site, but even that is threatened when Karolina secretly reconnects with Jonah, her father, to learn more about her alien origins. Back on the other side of town, the PRIDE parents no longer trust each other and want out of their partnership. Ultimately, however, they decide to unite one last time to take down Jonah and bring their children back home—no matter the price. With a cast of more than a dozen main characters, Runaways wisely splits itself into multiple narratives, allowing each character to have his or her own space to shine. While this resulted in an action-packed season, some storylines worked better than others. Runaways’ biggest downfall is whenever the show decides to plunge itself into that literal hole PRIDE keeps digging in their construction site. Midway through the season, Jonah reveals to Karolina not only that his spaceship is hiding down there but also the rest of his (and Karolina’s) alien family. It seemed a bit odd, considering that Jonah never mentions any of these other people in the first season, but it’s understandable—the construction was one of the biggest secrets of the show. The problem with this storyline is that everything in the climactic seventh episode, “Last Rites,” when the spaceship is destroyed and Jonah is killed, didn’t actually happen. Instead, think of Jonah as a ghost: He merely possesses a body. When he is “killed,” the body dies, but Jonah himself is still alive—simply moving to inhabit someone else instead. To make matters worse, Jonah isn’t the only alien out there taking over other bodies, as three members of his family survived (two of which possess PRIDE parents, while one is yet to be revealed). A twist like that usually makes for a great story—if it makes sense at all. At no point in the show did Jonah even hint that he could possess bodies, so this whole twist of Gibborim anatomy (or lack thereof) just seemed cheap. It felt like the screenwriters realized they had written themselves into a hole by killing off the main villain and were desperately trying to undo their mistake. It also raises serious questions about Season 1: Why did Jonah insist on sacrificing human bodies so he could keep his host healthy when he could just change hosts and be done with it? This alien possession arc will certainly make for a thrilling Season 3, but it still feels like a last-minute decision in order to keep the fight between the Runaways and their parents going. It’s a noble cause because the season is at its best when the Runaways need to deal with the consequences of being thrown abruptly into adulthood. This is especially true for Ariela Barer’s Gert, who realizes that running away without her anxiety medication wasn’t a good idea. Gert’s struggle with her mental health is one of the most compelling narratives, and Barer’s vivid, vulnerable performance shows Gert’s mind spiraling down, making her stand out against her more powerful peers. At the other end of the superpower spectrum is Lyrica Okano’s Nico, who steps into the role of leader while yielding the magical Staff of One. Nico may easily be the strongest, but she has also been through a lot: PRIDE killed her sister, and now the Staff may be slowly driving her mad. As Okano trembles slightly in Nico’s quieter scenes, it becomes not a matter of if, but when her character will break. Runaways is at its best when it remembers that these aren’t superheroes, but they’re just kids trying to survive in an unusually cruel world. Runaways also remembers this when dealing with the PRIDE parents. Jonah is pure evil, but the PRIDE parents are all sorts of different shades of morality. 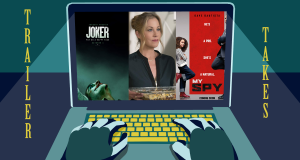 Karolina’s mom, Leslie Dean (Annie Wersching), struggles with the realization that her whole family and Church are based on lies, that all of her sacrifices helped an evil alien race. Gert’s father, Dale Yorkes (Kevin Weisman), is perhaps the most redeemable of the parents. He is always conflicted whenever his wife, Stacey (Brigid Brannaugh), shows no mercy in deciding how to bring the Runaways back home, ultimately leading to him making the craziest (and, quite frankly, most brilliant) decision in the season finale. Even Tina Minoru (Brittany Ishibashi), Nico’s ruthless mother, is painfully human. When Nico chooses to leave after being presented with an ultimatum of disownment, Tina visibly breaks, admitting she didn’t think Nico would be capable of it. If Season 1 asked what would happen if parents were supervillains, Season 2 is more curious about what happens when they aren’t super at all—they’re just people making terrible mistakes and fighting, just like their kids, to make it through the day. Runaways is a show full of heart that surprisingly works. It’s pure teenage angst and growing pains without ever being too edgy. 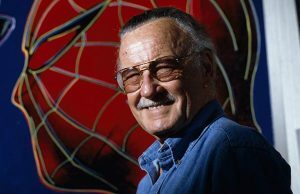 Its characters are less powerful and more ill-prepared than other Marvel heroes, but they still hold their own. In fact, I’d make a case that Iron Man (Robert Downey Jr.) and Captain America (Chris Evans) weren’t my heroes in 2018: it was Molly Hayes having her final solo showdown to the sound of “Mi Gente” and saying lines like “Badass Latinas: one. Aliens: zero.” In a world where there is an alien threat almost every other month, it’s not Runaways’ villain that keeps me hooked. It’s a team of six broken teenagers and their pet dinosaur who are still running, leaving me wondering where they will go next.